Thanksgiving is almost here, which means it's about to get Holiday AF up in my house! Buying Christmas Jammies has always been one of my favorite holiday traditions. We used to open them up the night before Christmas in my home growing up, but last year I started to feel like maybe I should break out the Christmas Pajamas early so we could enjoy them all month leading up to Christmas. I took a poll on Instagram and you guys mostly agreed that I should change my tradition, soo...I am! I've officially ordered our Christmas Pajamas, and wanted to share the best I've seen this year. Here are the Best Christmas Pajamas for Women in 2018. 1. Red and White Striped Thermal Pajamas - If you are looking for Christmas Pajamas for the whole family, I highly suggest going this route. These cute candy cane striped thermals come in styles for mom, dad, big kids and baby. 2. Naughty-ish Sweater - This company has made a big comeback and I am L I V I N G for all of their cozy loungewear. Their holiday game is no exception, including this cute Christmas sweater. 30% off is happening now too! 3. 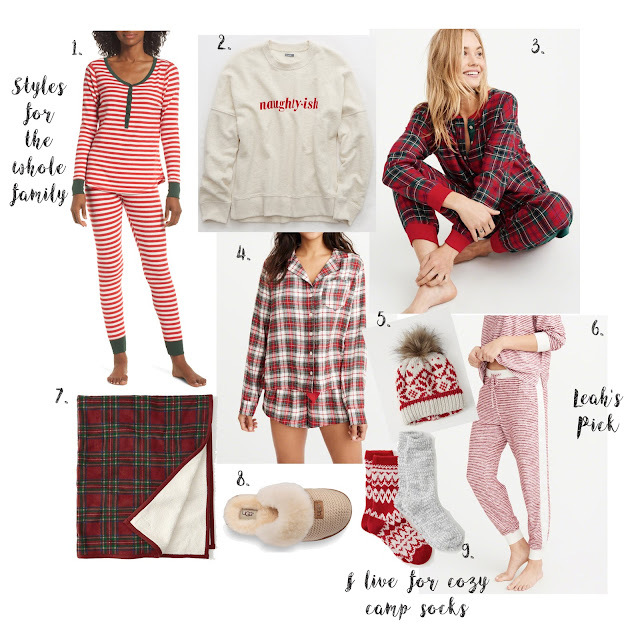 Best Christmas Pajamas for Women - This brand is killing the Christmas jammies game in 2018! I bought these joggers and matching shirt, but am loving everything they are doing. I even bought Brandon these loungewear pants/joggers for men. Everything below is currently 30% off too! 4. Uggs - So many cute Uggs this season! These always make great gifts for either yourself, your husband, or your mom and dad. 5. Cutest Cold Weather Accessories - I LIVE for cozy camp socks, and I found so many adorable styles that I may have hinted at Santa to put in my stocking. Also, loving this cute Christmas plaid blanket and pom hats. Do you have a tradition of buying Christmas pajamas in your family? If so, do you give them out at the beginning of December or the night before Christmas? We are big with Christmas jammies in my house. Great post and fabulous picks! I need some new Christmas pajamas this year. I'm loving all of your picks, especially that striped jogger set! These are always so fun!! I love all these cute options! Ah it is that time of the yeah again!! Ha!! Thanks for these lovely choices. Christmas jammies are the best! Love the cute picks dear.